Sihwan Kim loses in the round of 16 at the US Amateur on the 23rd hole to Charlie Holland. The two players tied 7 straight holes including the first 4 extra holes before Sihwan lost to a birdie. Sihwan Kim dominated in his 2nd match at the US Amateur winning 5 & 4 to advance to the round of 16 and he will play Charlie Holland of Dallas in another match today. Sihwan was very solid in his play this morning to steadily build up his lead. Match play results can be found here: http://www.usamateur.org/scoring/nml/reversetree.html. Previous results that were posted are shown below. Sihwan Kim wins his first match on the 19th hole beating Sam Saunders of Orlando. Sihwan was 3 up with 3 to play before his opponent tied it up after 18 holes. Kim parred the first extra hole to win the match. Sihwan moves on to play Matt Hill from Canada who upset Jamie Lovemark who plays for USC. 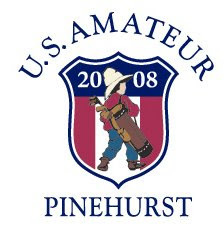 The two rounds of qualifying are complete at the US Amateur championship being played at the world famous Pinehurst Resort in North Carolina. Sihwan Kim was able to advance to match play as he shot 68-72 to tie for 10th. In Sihwan's second round he was at 5 over after 13 holes but birdied 3 of the next 4 holes to post a solid 2-over 72. A total of 64 players out of a field of 315 players move into the match play portion of the championship to determine the nation's top amateur player. Jordan Cox missed the cut by 2 shooting a 73-74 while David Chung shot 73-76 and Steve Ziegler shot 75-75. Stroke play scoring can be found at http://www.usamateur.org/scoring/nml/stroke.html. The main event website is: http://www.usamateur.org/. Final results are in at the Pacific Coast Amateur and Steve Ziegler ties for 10th with a 4-under 276 after a final round 71. Steve finished 5 shots behind the winner. Daniel Lim again struggled to a final round 74 to finish 6-over at 286 and tie for 36th overall. Dodge Kemmer's final round 71 left him tied for 60th at 14 over par in a disappointing tourney for him. Steve Ziegler is surging after a 2nd straight 66 (73-66-66) in the 3rd round of play, while Daniel Lim struggled to a 75 (68-69-75) and Dodge Kemmer remained well back after his 71 (73-79-71). The leader is 6 shots ahead of Ziegler. After two rounds of play, Daniel Lim tied for 11th with his 68-69, 137, Steve Ziegler tied for 20th with a 73-66, 139, while Dodge Kemmer struggle to tie for 74th with rounds of 73-79, 152. The leader is 6 shots ahead of Lim at 131. In the first round of the Pacific Coast Amateur Daniel Lim tied for 7th with his 68, while Dodge Kemmer and Steve Ziegler tied for 50th after their 3-over par 73s. There are two players from Canada tied for the lead with 5-under scores of 65. The tournament is being held at the Royal Colwood Golf Club in Victoria, British Columbia. Here are full tournament results. The tournament website ---pacificcoastamateur.com ---contains complete information about the course and event. A beautiful gallery of photos of this historic course created in 1913 can be found at this website. A final list of Stanford qualifiers for this year's US Amateur includes Sihwan Kim, Jordan Cox, Steve Ziegler and David Chung. The event will be played at famed Pinehurst #2 and #4 courses in North Carolina - photo from Pinehurst Resort website. The last qualifer was Sihwan Kim who shot an even par 69-71 at Hacienda Golf Club in Southern California after returning from the grueling, but successful Western Amateur in Michican. Here are complete scores from Sihwan's qualifier. In early qualifying both incoming freshman David Chung and rising sophomore Steve Ziegler (large photo) qualified for the 2008 US Amateur championship to be held August 18-24 at the Pinehurst Resort in North Carolina. Jordan Cox also qualified based on his earlier qualifying for the US Open. Here are complete 2008 Sectional Qualifying results from the USGA which will be updated for the next week as new qualifiers are completed. Steve Ziegler shot 71-69 to lead all qualifying in Colorado by 4 shots. This will be the second time Steve has played in the US Amateur, having qualified in 2006. Steve Ziegler Qualifying Results at Colorado Golf Club. David Chung shot 141 in his 36-hole qualifier in Hamilton, NY, to qualify as well. David's hometown paper covered the results. Daniel Lim, a rising senior, failed to qualify as he shot a 73-76 to miss out by 3 shots in a qualifier held at the Peninsula Golf Club in Northern California. Dodge Kemmer failed to qualify as well. Sihwan Kim will play in a qualifier next week.